When the question comes up with quarterbacks, your best the last few years would be USC. There are starters, back-ups, and even third stringers that played football at the PAC-12 school as USC has been a pipeline to the NFL for throwers, but with mixed results. Take Mark Sanchez, the fifth pick of the 2009 draft, a man who ‘led’ the New York Jets to the AFC Championship in his rookie season. In 2010, the Jets went to the AFC Championship game again. He threw three touchdowns in a playoff game against the New England Patriots and led a comeback against the Indianapolis Colts. New York was bounced by the Pittsburgh Steelers who went on to win the Super Bowl. The Sanchez stock was skyrocketing, people compared him to Joe Namath (the famous Jet even put his name behind Sanchez) and Jets fans put the Sanchez name on their backs with those ugly green jerseys. Fast forward through a subpar 2011, an awful 2012, Geno Smith and then the icing on the cake – a serious shoulder injury in a preseason game against the New York Giants – Sanchez looked to be heading in the direction of fellow USC QB Matt Leinart – a pundit on a non-ESPN sports network – before Philadelphia swooped in to salvage his career. At 28 years-old, the USC alum should be hitting his prime years and might soon have an opportunity with the Eagles offense getting off to a horrible start this year. And even if Philly head coach Chip Kelly stays with Bradford, the Oklahoma quarterback has not been healthy for an entire season since high school. Next up on our tour of USC quarterbacks, Matt Cassel, a man who never was the starter in college – sitting behind Carson Palmer and Matt Leinart. I think Blue Mountain State is based off of Matt Cassel. Somewhat similar to Sanchez, there was a brief hint of success early in his career. After a few seasons playing backup in New England, Tom Brady went down Week 1 and Cassel took the Patriots to an 11-5 record (only a tough AFC kept them out of the playoffs). Cassel was compared to Tom Brady (both were picked late in the NFL draft, Brady in the sixth round, Cassel in the seventh) and he got moved to the Kansas City Chiefs. Four years with Kansas City, and non-Tom Brady numbers, earned him a release from the Chiefs. The Cassel train then moved on to a terrible Minnesota team. Cassel now has another opportunity to be a backup quarterback on a new team as the Dallas Cowboys traded for him when Tony Romo went down. There could be a nice redemption story for the 33 year-old if he can beat out Brandon Weeden, but I doubt it. There may be a redemption story in the guy Cassel backed up at USC – Carson Palmer. The first overall pick of the 2003 draft. He turned out to be a massive disappointment, struggling to perform with the Cincinnati Bengals. Eventually, the orange-and-black got tired of seeing Palmer throw interception and interception after interception. He went to Oakland, where nothing good happens; and he then went to Arizona – a perfect place to retire. But it was in the desert that finally, things began to click. And with the Cardinals rolling to start the 2014 season, Palmer’s career took another turn – he tore his ACL for the second time of his career. Palmer has recovered and looked great to kick-off the 2015 season, and it would be remarkable if he could lead the Cardinals into the postseason after so many poor years; but whether or not he can stay healthy for a full season at 35 years old is a huge question. One of Palmer’s backups, Matt Barkley, is another former USC quarterback who has had his own share of downs and downs throughout his short career. Barkley has thrown as many touchdowns as you and me – zero, but his career has featured four interceptions and 300 passing yards. The jury is still out on Barkley, as this is only his third year of the NFL, but I have a hard time expecting anything out of a guy who is buried on the Cardinals depth chart. 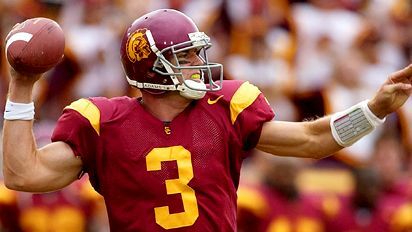 The final stop on the USC tour involves a quarterback who is no longer in the NFL but deserves a great mention – Matt Leinart. After an incredible career at USC, besides the whole losing to Vince Young thing, Leinart went on to have a horrible time in the NFL. He was dubbed as the guy to take over once Kurt Warner retired in Arizona, but Leinart never adjusted to the speed of the NFL. He held on to the football too long, and his only accurate passes were his tosses into the flat. Leinart was last seen on a Buffalo Bills practice squad. Of all the USC quarterbacks to pass through the school, have any had successfully NFL careers? Not particularly. The only one who seems to be on the verge of possible success is Carson Palmer, but at 35 years-old how likely is this to happen? Every USC quarterback seems to have his own crazy career path, with shorts highs followed by serious low points. Maybe Sanchez, Cassel, and Barkley will all find success late in their careers like Palmer, but that might be wishful thinking. Looking forward, the next Trojan to enter the NFL will be Cody Kessler, a quarterback who has been lighting up the PAC-12 and has received the usual generic high praise for the media – “pocket awareness, high iq, great decision maker.” Only time will tell if Kessler can break the mold.